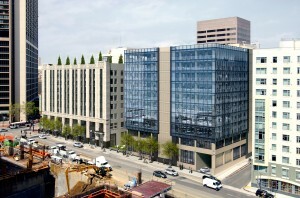 When Twitter signed a lease with Shorenstein Properties to take over 215,000 square feet of office space at the corner of Ninth and Market Streets, it was all over the headlines: by enacting a payroll tax exemption for the area, San Francisco had kept a growing tech company’s headquarters from jumping ship to the South Bay. Other tech companies moved to be near Twitter, and therefore other development projects started blooming in the city’s long-blighted Mid-Market neighborhood. That’s all great news for the city. But there’s a lot more to the story: the transformation of an enormous art deco furniture showroom building into offices for a 21st-century online social networking service and microblogging company is the latest sign of the mainstreaming of collaborative work cultures—and the need to adapt large urban buildings to accommodate them. 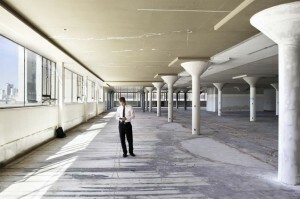 Tech companies today work in large groups with an emphasis on collaboration, which gives buildings with big floor plates an advantage in the market. But young tech workers are interested in living and working in or near dynamic urban cores, not commuting to office parks in the suburbs (or god forbid, living in the suburbs). Groupon has its headquarters in the 400,000-square-foot former Montgomery Ward distribution center in Chicago, and Google bought New York City’s block-sized former Port Authority warehouse a couple of years ago. 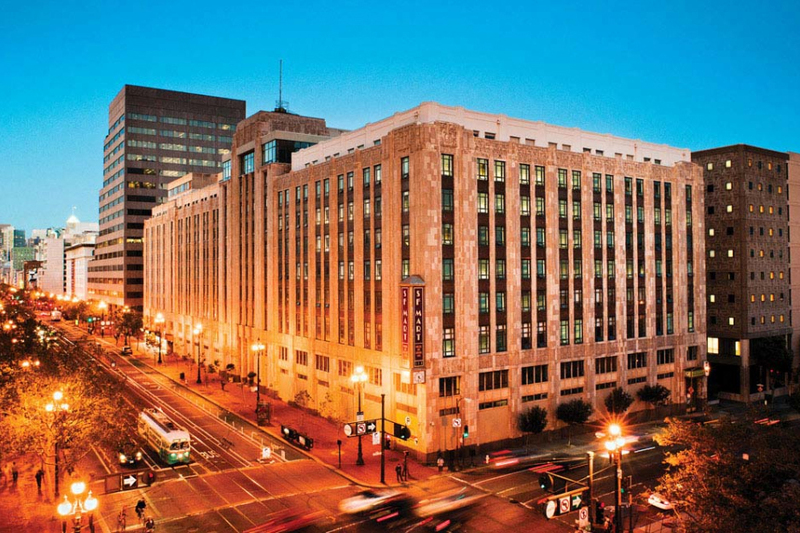 When buying the Western Furniture Exchange and Merchandise Mart at 1355 Market in 2011, and its neighbor, 875 Stevenson Street, Shorenstein Properties had these kinds of companies in mind. It was one of the city’s last few buildings with large floor plates. Built in 1937, 1355 Market once was home to hundreds of furniture wholesalers. But in 2005, the center of the home and hospitality contract furnishings industry shifted to Las Vegas with the opening of the World Market Center. The Mart closed its doors three years later. 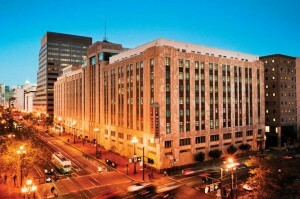 Twitter had been eyeing the building for some time, and finalized the lease in 2011, shortly after Shorenstein bought the Mart. Of course, there had to be some significant adjustments. The mechanical, electrical, and plumbing systems were all 80 years old and had to be completely replaced. Despite the building’s enormous size, it only had four elevators, because the furniture wholesalers opened their doors to the public just twice a year. So we added a bank of elevators. And 875 Stevenson (now dubbed 1 Tenth) had small, three-foot-square windows everywhere—great for keeping sunlight from fading the upholstery, but not so great for people. So we’re in the process of cutting the skin off the top eight floors and replacing it with a glazed facade. Other historic elements came in handy. 1355 Market (now Market Square North) was built piecemeal: a wing was added along Ninth Street in the late 1930s, and an addition was constructed at the ninth floor in 1941. Because of the war, steel wasn’t available, so the addition was built out of wood. In converting the building, we had to tear down this addition because of fire safety issues—fortunately, this was the perfect place for a roof deck. The Market, Ninth, and Tenth Street facades, as well as the main lobby’s historic interior, were all still fairly intact and were restored. In addition to bringing the lobby back in all its marble glory, we created a new lobby at the corner of Ninth and Market, and this one clearly reads as new. When we dismantled the 1940s ninth floor addition, we found huge Douglas fir beams, the kind you just can’t get anymore. 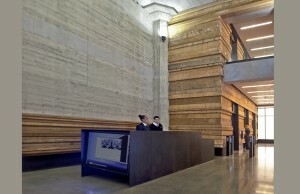 We cut them up and repurposed them as wall panels in the new lobby to add texture and warmth. To facilitate flexibility, we focused on very simple materials for the interior. On the outside, it’s a historic terra cotta building. But when we stripped away the inside, what became obvious were the huge, very muscular concrete columns. We used these as our design cue for the look of the interior, which features concrete, wood, and steel. So the inside and outside are a study in contrast. There will be a variety of retail and food vendors on the ground floor. 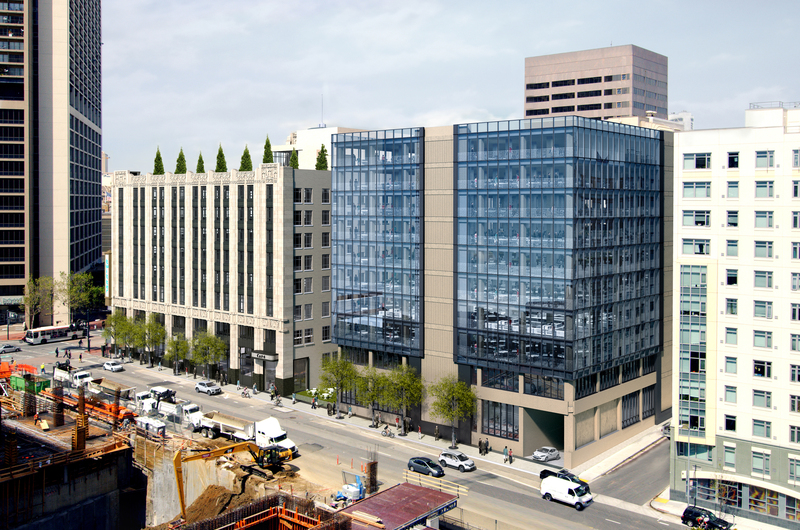 Shorenstein also bought Stevenson Street, which runs between the two buildings, and has plans to transform it into a pedestrian promenade. Mid-Market has struggled for decades, but the needs of the tech world and the hopes of the city are dovetailing in this revival. Thanks to the young tech workers looking for vibrant urban locales, and to the tech industry’s hunger for buildings with character and sizable floor plates, Mid-Market is finally getting its due.